WASHINGTON, DC, May 17, 2011 (ENS) – The most endangered river in the United States is at risk from natural gas development and the hazards associated with hydraulic fracturing, or fracking, for the second year running, according the American Rivers annual list of the country’s 10 most endangered rivers, released today. The clean rivers advocacy group placed the Susquehanna River at the top of this year’s list, citing the rush to develop natural gas reserves in the region without considering the risk to clean water and public health. Last year’s most endangered river was the Upper Delaware, also threatened by natural gas extraction. On the Susquehanna River, which runs through New York, Pennsylvania and Maryland,the fracking process requires taking large amounts of water from rivers and streams, which is then mixed with sand and toxic chemicals and pumped underground to extract the natural gas. 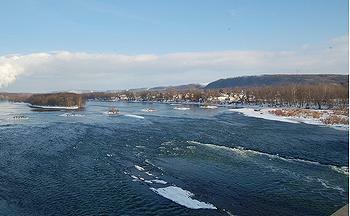 The Susquehanna provides drinking water for more than six million people. Current facilities cannot adequately treat the highly toxic wastewater that is generated, and there are insufficient government regulations to ensure the wastewater doesn’t contaminate drinking water supplies. American Rivers today called on the Susquehanna River Basin Commission and the states of New York and Pennsylvania to issue a moratorium on natural gas drilling-related permits until companies can prove they can operate without damage to the river and clean water supplies. American Rivers also called on Congress to remove the loopholes that have allowed the natural gas industry to avoid basic standards for public and environmental health. This year American Rivers added a “special mention” on the 2011 list for the Mississippi River, given the current record flooding. “While levees and floodwalls will continue to make sense in some heavily populated areas, their overuse actually causes flood levels to rise as the river channel is narrowed and water has nowhere to go but up – making flooding worse for communities downstream. 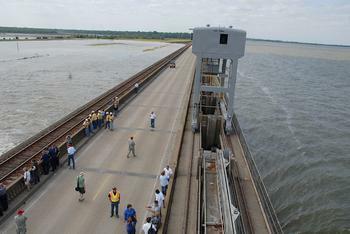 Levees should be our last line of defense, not our only line of defense,” he said. American Rivers recommends instead a strategy that combines structural flood protection solutions like levees with “natural defenses” like healthy wetlands and floodplains that absorb floodwaters. “Healthy rivers are great assets and give communities so many benefits, including clean water and natural flood protection,” said Fahlund. The daily discharge of 1.2 billion gallons of undisinfected sewage effluent into the Chicago River system threatens public health and has earned the river fourth place on the annual list of America’s Most Endangered Rivers. The sewage effluent, released by the Metropolitan Water Reclamation District, threatens public health and the city’s environmental reputation. The effluent makes up 70 percent of the water in the Chicago River system. Supporting over six million residents regionally, the Chicago River flows through the nation’s third largest city. Tens of millions of dollars have been invested in river access and improvement including $100 million by Chicago and the Chicago Park District in the last 10 years. American Rivers called on the Illinois Pollution Control Board to approve the proposed water quality standards for the Chicago River that have not been reviewed in more than two decades. These standards would require the MWRD to disinfect sewage effluent. For 26 years, American Rivers has “sounded the alarm” on 360 rivers through our Americas Most Endangered Rivers report. The report is not a list of the worst or most polluted rivers, but is a call to action for rivers at a crossroads. American Rivers’ staff and scientific advisors review nominations for a major decision that the public can help influence in the coming year, the significance of the river to people and wildlife, and the magnitude of the threat, especially in view of climate change. American Rivers takes credit for successes such as the removal of outdated dams, the protection of rivers with Wild and Scenic designations, and the prevention of harmful development and pollution.